What is the Super Lemon Haze Strain? Super Lemon Haze is a tall glass of lemonade on a sweaty summer day. It’s a taste of citrus and a spark of energy. Like all things citrus in nature and essence, it has the potential to wake you up, spruce you up, and help you through your tasks with vigor. If you naturally have an energetic or high-strung personality, then this strain isn’t for you— instead, you want something more relaxing. 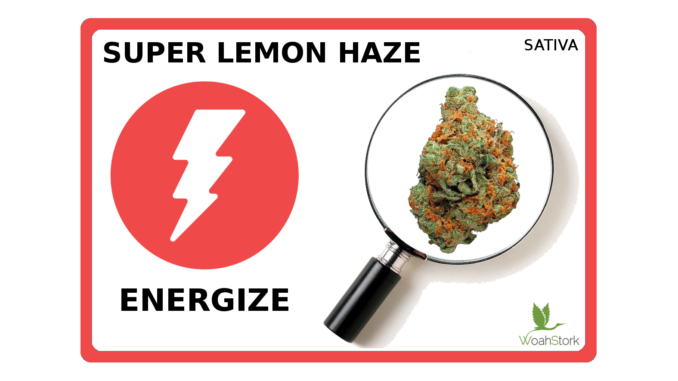 However, if you find yourself slugging through the day and constantly struggling with fatigue, or if depression and anxiety has you down in the dumps, then Super Lemon Haze may just be the superhero you need. The sweet yet tart citrusy aroma of Super Lemon Haze is matched only by its lip-puckering candy taste. This strain was bred to perform and impress. Let’s start with the female genes: Arjan of Green House Seeds pulled from his famous Super Silver Haze, which had won the Cannabis Cup three years running— 1997, 1998, and 1999. Arjan then carefully bred this champ with a triple-cross of Haze, Skunk #1, and Northern Lights #5. The product of this breed was then combined with namesake number two: the popular Lemon Skunk. The combination paid off, as Super Lemon Haze went on to win the High Times Cannabis Cup itself for two consecutive years (2008 and 2009), which we’re sure made the Super Silver Haze proud. Super Lemon Haze didn’t stop there, moving on to take first prize at the IC42 Growers Cup and only slipping to second at the Cannabis Cup in 2010, securing its popularity and ensuring it would become one of the most recognizable strains on the market. No matter if you’re a growing pro, aspiring herb farmer or are simply interested in what makes this strain so special, understanding where it comes from and what elements make it thrive can help. Preferred Climate: Mediterranean, sunny yet shaded. Ideal temperature range is between 68-80 degrees Fahrenheit. Can withstand humidity up to 55% RH while flowering. Outdoor vs Indoor Growing: Super Lemon Haze does well both inside and out of doors, though you’ll have different planting times and yields. An indoor yield averages 28 ounces while outdoors is closer to 35. When grown out of doors, yield is typically ready between the middle and end of October. Feeding Overview: While this plant is tall, it’s not very dense— be aware of overfeeding as this strain is at risk of nutrient burn. During budding, you will want to increase nutrients before the flush to help the grow period finish strong. This strain’s namesake is obvious at first whiff. If you ever enjoyed Lemonheads as a kid, then this scent is a one-way ticket to nostalgia with its strong, citrusy overtones. Most often affiliated with lemons, others will describe a strong orange or grapefruity smell. Basically— any citrus you can think of, your nose will experience. A hint of earthy spice hidden beneath will help ground the aroma, and keep your attention, not letting you forget that this herb is special. Your tongue and nose will agree on this one. The tart, puckering lemon is met with hints of candy, citrus, earthiness, lime, and tanginess. The taste has been compared to a cool glass of lemonade or citrus marmalade, but others have relayed the taste experience to candy and sweets. One thing is for certain: the flavor and aroma combination is quite popular. Super Lemon Haze is quite the experience, ranking high in the euphoric benefits. It’s jam-packed with sativa-dominant hype. Its scent and flavor are almost as invigorating as its effects! Let’s face it, we joke about living on coffee and soda, but many of us would love a healthier alternative to drowning ourselves in caffeine. Super Lemon Haze may just be your salvation. Caffeine can give us the jitters, OTC medicines have their own side effects. Unfortunately, this strain of cannabis doesn’t escape the potential. Most reported side effects involve dry mouth, though occasionally users report dry mouth. The more extreme side effects, however, only come from the strains with higher potencies of THC taken in large quantities (read on to the next section for more information there). Still, you need to know what to prepare for when you first give Super Lemon Haze a try. Super Lemon Haze can be more than just a mood or energy booster—it can also help alleviate the symptoms of certain medical conditions. If you are wanting to use cannabis for medicinal purposes, it’s a good idea to talk to your physician and make sure it won’t interfere with any current medications. One of the most essential questions with any strain: what is the THC potency? In this case, the uplifting euphoria of Super Lemon Haze comes with a THC potency up to 25%. While average potency is closer to 16%, it’s important to note that the heavy hitting doses can be much higher. These higher potencies in large amounts can lead to feelings of paranoia or anxiety in the hands of more novice smokers. The Super Lemon Haze is a feast for the eyes, not just the nose and tongue. Vibrant colors and a dusting of glistening trichomes lead one to wonder when Wonka’s Oompa-Loompas will appear for harvest. Or perhaps we found the reason Captain Hook was so obsessed with Never Land. Whatever the memories this strain evokes, there is no denying the vibrancy of its neon green budges and orange-yellow pistils. Reading about a new strain is one thing— experiencing it is something entirely different. Below, we’ve taken feedback from actual users. Thoughts may be paraphrased and/or edited for clarity. Names have been removed for privacy. 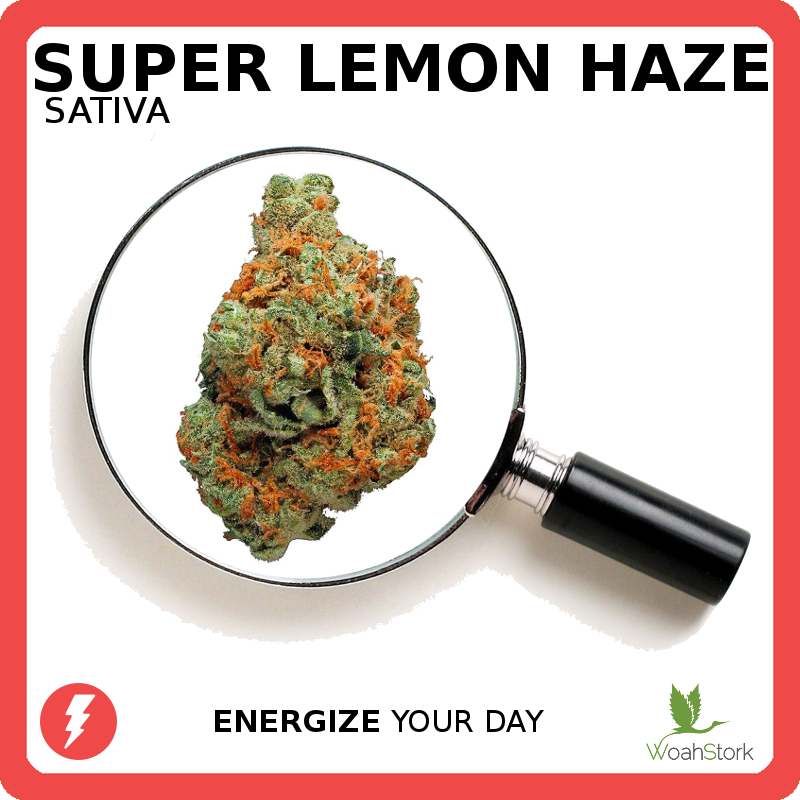 WoahStork’s online cannabis marketplace has Super Lemon Haze for sale online where you can place an order for Super Lemon Haze in different forms: flower, oil, vape pen, concentrate, edibles, etc. While it’s not a good starter for the novice reefer, Super Lemon Haze belongs in any veteran’s book of experiences. Whether you’re looking to liven yourself up or need an extra spark of creative energy, this strain is definitely worth a try. Speaking of novices, the amateur grower will want to hold off before trying to add Super Lemon Haze to their repertoire. While highly resistant to diseases, it’s still in the moderate category of difficulty— it’s best to get your feet wet with a more resilient strain. But you don’t just have to take our word for it. Like all strains, you’ll never really know if Super Lemon Haze is right for you until you try it. If the perks sound perfect, then give it a go— responsibly, of course.